There are plenty of varieties of green tea. The main feature is its manufacturing processing technology, which does not occur during the fermentation of tea leaf . For green tea stop fermentation - "killing the green " - produce immediately after harvest . This allows the tea to preserve green leaves and present , and its taste and aroma of fresh green note prevails . Distinguish types of green teas on the tea bush , by collecting and processing technology , in the form of tea leaves at the place of origin , and of course, quality . 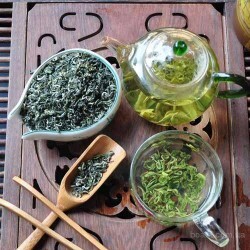 Of particular value are teas spring collection resulting from the processing of young leaves and buds. As a rule, they have extended or twisted shape . Zhu Hua Lun "Jasmine Pearl"